TIP: You can replace the soup mix with ½ – 1 teaspoon onion powder and ½ teaspoon garlic powder. Lightly rinse and pat dry the stew meat. Sprinkle with salt and pepper. Add oil to fry pan and preheat on medium-high. Once the pan is hot, add the stew meat and cook until browned on all sides. TIP: If the pan fills with juices from the meat, you can drain the juice off and put it in the stew pot. This will quicken the browning process. Once browned, place the meat into your stew pot or large Dutch oven. Place the onion in the fry pan and cook until browned. About 10 minutes. Add to stew pot. Pour 2 cups of your beef stock into the frying pan and heat. While it’s heating, scrape the pan so that all of the brown bits from the meat and onion are absorbed into the stock. Pour the heated stock over top of the meat in your stew pot. Now add enough of the stock reserve to the pot to cover the beef. TIP: We like extra gravy so we add extra stock to the pot. Add the bouillon cube, pepper corns, hot pepper flakes and onion soup mix. Place on the stove top on medium heat until the stew just begins to boil. Reduce heat and simmer for 1 hour. After 1 hour, add the heartier vegetables if using: potatoes, carrots, turnips ect. At this point you can also add the gravy mix, if using. It is also a good idea to taste the broth to see if you need to add any more spices, salt, pepper, etc. TIP: We like to use the gravy mix because it adds an extra bit of beefy flavour, but it does add extra salt. You may want to replace with 2 low sodium bouillon cubes or else leave this step out entirely. Simmer until the vegetables are tender, approximately 1 more hour. Now you are ready to thicken the stew. To do this, we remove approx. ¾ cup of the juice to a bowl or measuring cup. To this add 2 tablespoons of corn starch and mix until well blended. Return this to the pot and simmer until it thickens. If you would like a thicker stew, repeat the process until you get the consistency you like. TIP: Do not overheat as this can reduce the effects of the cornstarch. Now is the time to add tender vegetables like peas and heat until they are warmed. TIP: We usually leave out the potatoes and ladle the stew over mashed potatoes. Mmmmmmm. TIP: The stew freezes well, but may need to be re-thickened once reheated. 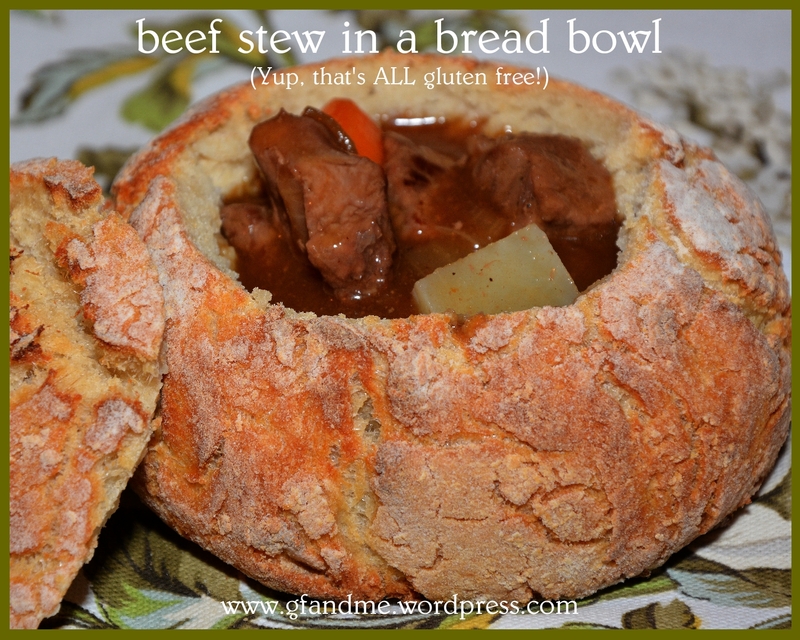 TIP: If you want to serve the stew in a bread bowl, here’s what we did: Make gf and me’s crusty bread or crusty bread II. Once cooled, cut the top off and hollow like you would a jack-o-lantern. Fill with stew and that’s it! Don’t forget to follow us on facebook. You’ll get two – three recipes delivered to your newsfeed every week! Or sign up on the left hand side of this page to get our posts by email or RSS feed. This entry was posted in Lunch and Dinner, Recipes and tagged beef, bread, dairy free, dutch oven, gluten free, holidays. Bookmark the permalink. Thanks! It was fun photographing this one! Looks good, was the bread the easy crusty bread? Looks delish. 🙂 I’ve never had a bread bowl before and have always wondered do you eat the bowl when you finish the stew? Or is that bad etiquette? Etiquette schmetiquette – the bowl is the best part! This bread is very easy to make. In fact, a lot of gf breads are pretty easy – no kneading or second rising. I have to admit though I still haven’t found that magic recipe that tastes and acts like wheat flour bread!